Fantastic cata last night at the Union Española de Catadores as José Ruz of Perez Barquero and Paco del Castillo lead us through the wines of this great Montilla bodega. As you can see, there were some real heavyweight wines to be tasted, and I for one learned a few interesting things. 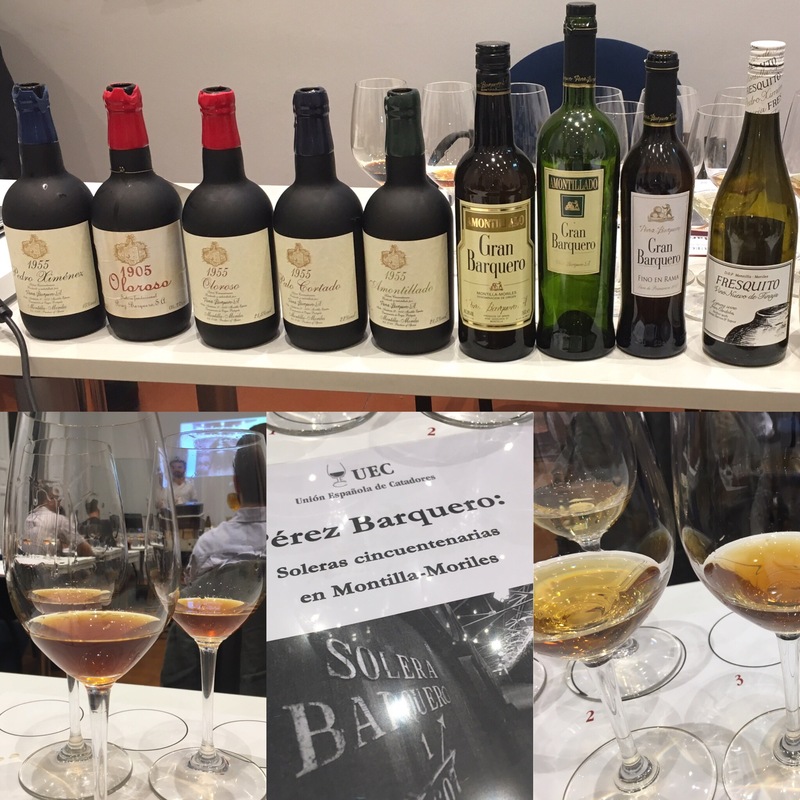 We started with Fresquito, a sparky vino de tinaja, then moved smoothly through the gears with the Fino en Rama Gran Barquero (Spring 2017), the Amontillado Gran Barquero, an Amontillado Gran Barquero bottled in 1996, the full range of Solera Cincuentenario wines – the Amontillado, the Palo Cortado, the Oloroso, and the Pedro Ximenez – and before that last one the Oloroso Solera Fundacional (Lot B). I am a huge fan of the Amontillado Gran Barquero – an absolutely world class wine – and it would take some persuading for me to choose any of the others over it last night. There was a lot of concentration and a lot of intensity on show, and some rare and expensive wines (sacas of 200 and 500 bottles), which really had very distinct profiles. In fact, it was very interesting and quite disarming to hear that the Cincuentenario Palo Cortado – one of the stars of the night – was the result of barrel selection rather than any intentional process. Motivated by the current high fashion status of palo cortados the guys at Perez Barquero had selected from amongst their older olorosoa the wines they felt had that kind of profile – without really knowing why they did. It would not have been due to selection or mostos, because they were all olorosos, but it could have been some biological action in the tinaja before the wines entered the solera. (Perhaps there is some mystery after all.) In any event, and whatever the cause, there was no doubting the difference in character between this and the oloroso. It wasn’t the only star either. The Oloroso Solera Fundacional was an absolute beast – brandy, salinity, burnt Christmas cake and a finish like the after dinner cigar (and nearly as long). One of those wines that you consume with extreme care. I could and will write a note on all the wines because the standard was exceptionally high across the board, but the one I could drink gallons of is the current Amontillado Gran Barquero. It is the standout in terms of elegance, profile and all round flawlessness – a marvellous wine that only gained in comparison to the bigger beasts. And a word of thanks and congratulations to José and Perez Barquero, the UEC and Paco del Castillo for a fantastic tasting – really top class. There is a CT note describing a Amontillado Gran Barquero, an Amontillado Gran Barquero Solera 1996, abandoned in the Canaries, with chunks of solid material and notes of burnt butter. Wouldn’t warehousing outside the Triangle present legal problems for the marketing of this wine? Wasn’t really warehoused there – it was sent to a retailer to be sold then forgotten in their stockroom before being recovered. In any event the triangle rule only applies for ageing before bottling. Reading my comment seems to make the situation gruesome. Sorry–didn’t mean to disrespect the wine, just gain knowledge. It’s strange how this same wine could so impress you. The CT guy gave it 91 points, anyway. I also meant to compliment you on the photos and the knack you seem to have to getting invited to some super tastings!